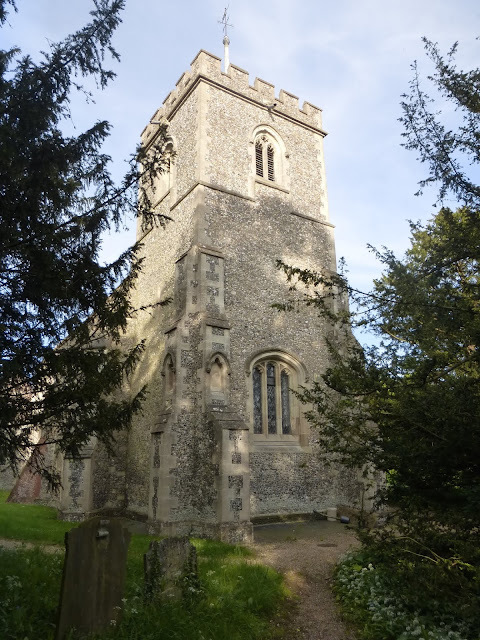 Benington church, a few miles east of Stevenage, has some 15th century features in the ubiquitous Perpendicular style (notably the tower and clerestory windows), but what makes it stand out is that much of it, fairly unusually for Herts, is Decorated. That is, in the style dating from roughly the first half of the 14th century. It's such a pleasure to be able to relish the rich carvings of the period; much of the church is delectably, dazzlingly and divinely Dec. In the spring, the daffodils in the churchyard aren't bad either. The church's story starts with the sedilia (the three stone seats for the clergy on the south wall of the chancel). They're late 13th century (though no doubt restored), in the Early English style; the plain round columns supporting capitals carved with slightly artificial-looking foliage known as stiff-leaf are typical of the period. This hooded figure lurks among the more than usually stylised foliage. The arches are cusped and quite elaborately carved; it's illuminating to compare the sedilia with that of Anstey, which are roughly contemporary but much plainer. Why the clergy in Benington thought they deserved such fine seats we shall never know. Usually, the sedilia and piscina (a drain in the wall for washing the communion vessels) were made at the same time to a unified design. But Benington's piscina dates from a couple of decades or so after the sedilia. Was there originally no piscina, or was it thought that it needed updating? Again, we'll never know. The piscina we see now reveals its Dec credentials with its little upward flick at the head of the arch, creating two S-shaped curves, known as ogees. The two label stops look as if they could be portraits: a man on the left and a woman on the right, perhaps? At about the same time (let's say c.1310) the lower part of the nave was constructed. The bottom tier of windows (the upper clerestory windows are a later, 15th century, addition), like the piscina, have the elegant Dec ogee S-curve in their tracery. The highlight of the church (the thing that makes it worth bicycling twelve miles against the wind to see, to borrow John Betjeman's way of praising outstanding features) is the arcade between the chancel and north chapel, and all the associated carvings. 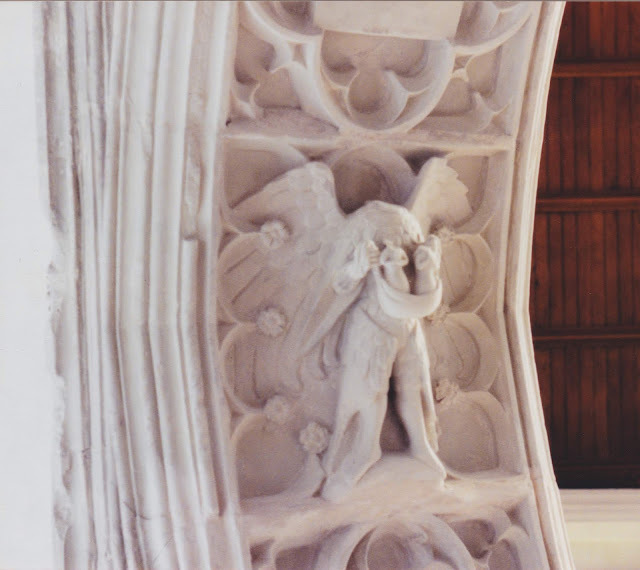 The chapel dates from c.1330; the central and western arches have complex mouldings (but plain capitals). The central arch doubles as the canopy for a tomb. The arch has a little ogee swoosh at the top, like the sedilia, is crocketed and finialed, and has flanking pinnacles, as well as label stops. It's a grand piece. The altar tomb itself, and the effigies on it, are in a poor state of preservation. The base seems to have been cut in two and crudely put back together. The knight (the first John de Benestede) is shown in the act of pulling his sword from its scabbard; he has his head turned slightly to the right, and his legs crossed. (Even today you sometimes hear repeated the story that an effigy with crossed legs indicates that the man depicted was a Crusader. There's no truth at all in this. For one thing, the Crusades had petered out by 1272, at which time John was probably only a child, or perhaps hadn't been born at all. The crossed legs were simply an artistic fashion, designed to give animation to the figure. *) His wife is distressingly blank-faced; she has a long veil, and her hands, once praying, have been broken off. Her feet rest on a dog (symbol of fidelity, hence the traditional name for a dog, Fido), his on a lion (symbol of strength and courage). Fortunately, the tomb's ancillary carvings are in very much better condition. This might be a portrait of John; it's highly accomplished, more naturalistic than most busts of the period, suggesting an aristocratic hauteur but also sensitivity. Maybe my local loyalty to Herts is making me go overboard here, but I doubt if there are many finer portraits of this period in the country. On the other hand, the corresponding carvings on the other (eastern) side of the tomb bring us down to earth with a bump. 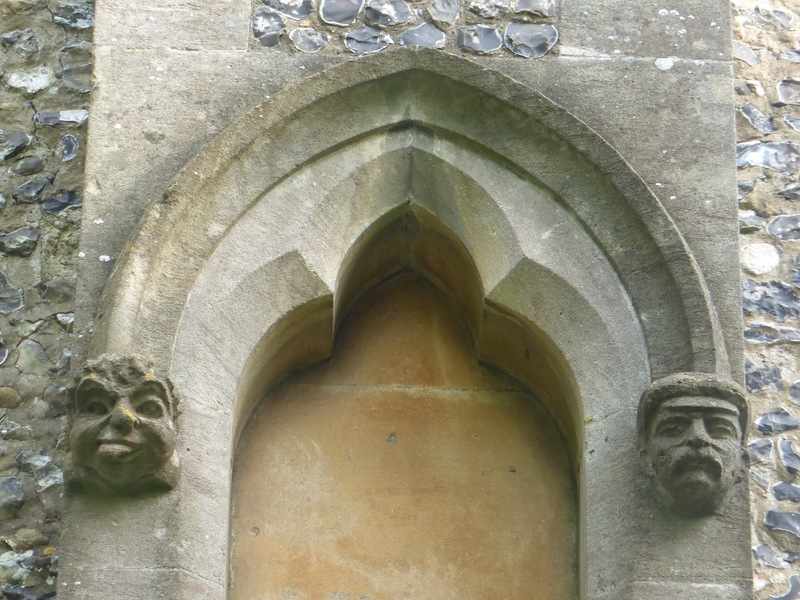 Here we have a comical mouth-puller and a fiercely grimacing head. It seems strange to us that a dignified tomb should be decorated like this, but such juxtapositions are so common in medieval art that we must assume that no contradiction was seen between the sacred and the (apparently) profane. The western end of the western arch terminates in another mouth-puller, even more vigorously carved than the first. On the northern side of the tomb (facing into the chapel) are more little carvings. There's a head with a very fancy hairstyle, and a king whose body has been pierced by a sword. He is struggling to pull it out. In its way, this is just as odd an addition to a tomb as a mouth-puller; why adorn it with a representation of the brutal killing of God's representative on earth? The old sign which hangs from the figure suggests that the king may be Edward II, who was assassinated in 1327 (ie soon before the tomb was probably made), and who, the sign speculates, the de Benestedes presumably knew. Perhaps the people who saw this carving in the 14th century would have taken it to be a lamentation for an act of regicide. This is probably a portrait of Parnel (or Petronilla) de Bernestede, but it's not nearly as fine as that of her husband, despite the fact that it was very likely carved while she was alive. In fact, she may well have paid for the tomb. To the east of the tomb of John and Parnel de Benestede is that of Edward (d.1432) and Joan (or Joanna) de Benstede, which is more or less exactly a century newer than the former. Some Dec features have survived - the ogee heads to the niches on the side of the tomb chest, and some ogee curves in the panelling of the soffit (the underside of the arch canopy) - but otherwise the style is different. The 15th century Perpendicular masons were much more interested in surface decoration than their Dec counterparts, and made more use of straight lines. The effigies of Edward and his wife are better preserved than those of John and Parnel. Eileen Roberts** suggests that Joan paid for the tomb after her husband's death, as her effigy is more elaborate than his. (However, visitors to the church will currently find this difficult to see for themselves as the far east ends of chancel are chapel are roped off and alarmed, making access to the tomb difficult.) Roberts is dismissive of his effigy, calling it 'provincial in execution'. She notes that 'the helmet is impossibly small, and the details of the armour construction in skirt and coutres misunderstood.' I can sense the poor mason, who no doubt followed Joan's instructions as well as he could, wincing across the centuries at this indictment. Can there be any greater shame than misunderstanding your skirt and coutres? 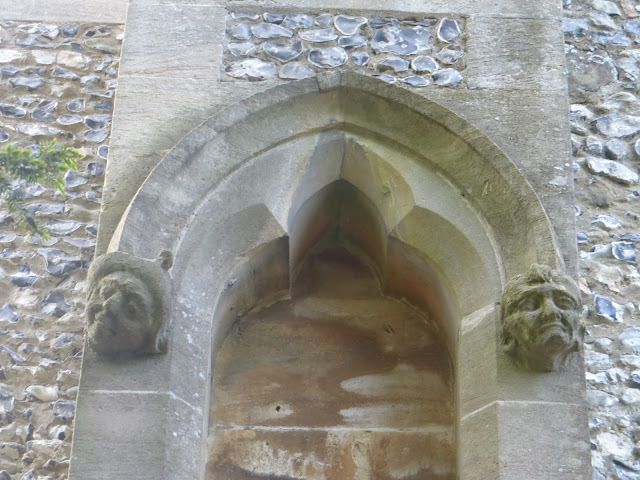 At the apex of the arch canopy has a sculpture of an angel holding the souls of Edward and Joan in a cloth, and presumably carrying them up to Heaven; all three figures have lost their heads. Again, this is hard to see properly at the moment; I took the picture above in the 90s. Some tiny fragments of medieval glass survive; this one is in the south wall of the chancel, and lights the de Benstede tombs; appropriately, it depicts the family arms (described, in the seductive language of heraldry, as gules three bars gemelles or). The arms of the Moyne family; the second Parnel (d.1378) was a Moyne. The language used to describe this one is even better: azure a fesse dancetty between six crosslets argent. Dancetty! I can't wait to work that into conversation somehow. 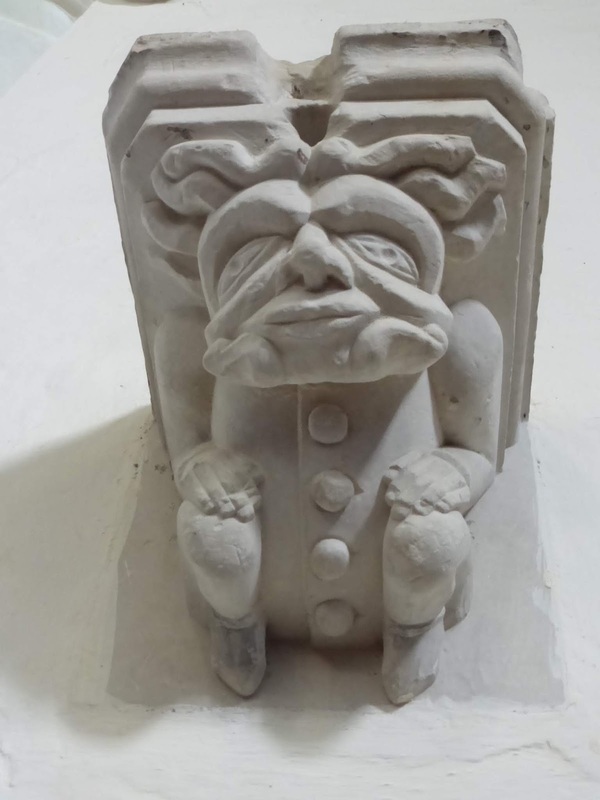 As well as the tomb carvings, there are numerous corbels, label stops and other little sculptures scattered around the inside of the church, many of them worth a look. The chancel arch was widened in the 15th century, but it seems that the 14th century corbels were reused, including this Green Man, or foliate head as we should probably call them. 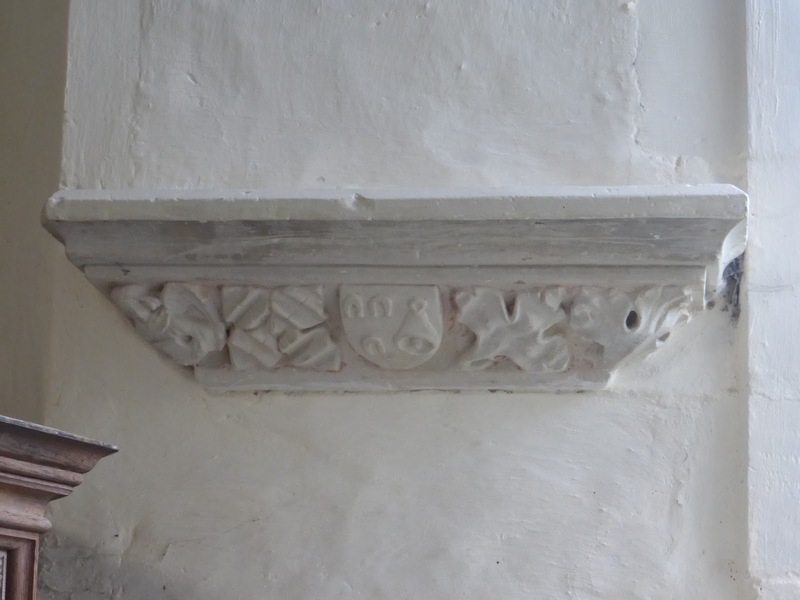 I think this is my favourite of the nave corbels: perhaps a wodwo (a wild man of the woods). He or she has a cross on their forehead. Perhaps a woman with her hair tied in bunches. An extremely lively caricature-like figure by the pulpit and probably intended as the base for a statue of a saint, showing once again the unselfconscious juxtaposition of the secular and spiritual. He seems to be dressed as Batman. The ones on the tower were recut in 1907 by someone who knew what they were doing. More carvings from the tower. Again from the tower. The head on the right looks like Stalin (though not like Stalin in 1907), but depicts the then sexton. As you can see, it's a memorial to a husband, the rector for a quarter of a century, who was a keen apiarist and reader, and his wife, a painter, both of whom loved gardening. It was made in 1994 by Chapel Studios, though I can't find the name of the designer. It might not be a masterpiece, but surely only the grumpiest curmudgeon would fail to be charmed by it. We began with daffodils, and we end with them too. Benington church has always been open and welcoming whenever I've visited. The village is extremely pretty, and Benington Lordship, next to the church, opens its gardens (especially notable for their snowdrops in late winter/early spring) occasionally, where you'll also find the remains of a genuine Norman castle elaborated into an impressive 19th century folly. * This story, which I always assumed to have its origins in sentimental Victorian ecclesiology, or possibly to have been started by 18th century antiquaries, turns out to be older than that. It dates from as long ago as the late 16th century. See this blog. ** A School of Masons in 15th Century North Hertfordshire, Hertford, 1979.